Due to the numerous high quality applications, it was a demanding task for the referees of the international review panel to select only one candidate. All participants demonstrated the great potential of young colleagues in the area of Vision Research and Ophthalmology. Therefore, the European Vision Institute will continue to support career opportunities in this highly important field. First of all, let us congratulate Juan Tabernero for his great work. During his PhD studies, he was focused on the understanding of the compensation of aberrations between the cornea and the human lens. It was then established that compensation was mainly presented in two aberrations terms, spherical aberration and horizontal coma. Using sophisticated optical instruments developed at the lab and accurate optical modeling calculations, it was shown that the shapes of cornea and lens were perfectly accurate to generate this effect. Any other shape would have been optically possible (keeping the same ocular dioptric power) but with no such a nice effects in compensating aberrations (published in Nature Photonics 2008). 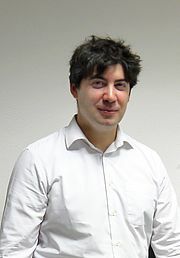 After defending his PhD in December 2007, Juan joined Frank Schaeffel´s lab in Tübingen (Germany) where he worked in myopia research during 2008 and 2009. His main work was focused on building a peripheral refractometer based on photoretinoscopy for the human eye. The instrument was successfully tested and applied to a general population as well as to a pseudophakic group. In myopic eyes, the peripheral refraction showed up more irregularities than in normal eyes perhaps indicating more scleral weakness in myopia than in the normal developed eye. At the beginning of 2010, Juan Tabernero rejoined the lab in Murcia were he has been working until today on the visual testing of a non-conventional solution for presbyopia (the application of the pinhole effect to corneal inlays) and developing a novel method to assess the dynamic stability against saccades of the human lens and intraocular lenses using ultrahigh temporal resolution cameras and Purkinje images. ABSTRACT: The effects of cataracts, presbyopia and myopia are well described in the classical physiological optics literarature. Even some "old time" optical corrections are commonly used today. Recent experiments based on advanced optical technologies challenge some of those solutions. The understanding of the balance of aberrations between cornea and lens in the human eye has provoked a revolution in the optical design of intraocular lenses for cataract surgery. In presbyopia research, the application of the pinhole effect to corneal inlays may suppose a terribly simple but otherwise effective solution. And the myopia research community is still strikingly looking at the effects of new spectacle designs that modify the peripheral optics of the eye and pretend to stop the progression of the disease. This talk will briefly review the concepts and basic experiments generating all these new research lines that will eventually lead to a general improve in functional vision of the population. What were your first thoughts, when you got the news to be the Carl Zeiss European Young Investigator Awardee 2012? Juan Tabernero: It is a tremendous boost of support to the research work I have done so far! A great motivation to keep working hard in such an interdisciplinary field as visual optics. I also had a feeling of gratitude to my mentor and PhD supervisor, Pablo Artal and to all my friends at the labs in Murcia, Tübingen and other labs I visited for work purposes. They made possible this award. I could not have been working in a better environment during my PhD studies and postdoctoral work. What is the source of excitement for your scientific work? Juan Tabernero: The source of excitement comes from the feeling that your work might be useful for people, and more important, that you can almost see how it affects them. In this sense, I consider myself very lucky since our research lines are very applied to real topics that everybody can feel and "touch" in the "macroscopic" world. As a physicist, I consider this an advantage with respect to other more basic disciplines where it seems to me more difficult to reach that feeling. What were the most thrilling discoveries in your professional career so far? Juan Tabernero: I am especially proud of all the work we did in Murcia on the understanding of the compensation of aberrations in the human eye between the cornea and the lens. The fact that the shapes of the lens and cornea in the human eye might correspond to those of quite an advanced artificial optical design to avoid higher order aberrations implies that nature made our optics (under normal conditions) very robust! Besides, all the research derived from it had a lot of implications in the ophthalmic market, especially in the design of intraocular lenses for cataract surgery. Second, I am also very happy with the work we did in Tübingen on the peripheral optics of the eye and all the implications that might have on the myopia development. With low cost components and equipment we could manage to build up a very useful and effective instrument to scan the peripheral refraction. We nearly opened a research line that nowadays is followed by many labs around the world. What are your next targets within your research field? Juan Tabernero: At the lab in Murcia we are working on understanding the mechanical properties of the crystalline lens and intraocular lenses for cataracts, especially on the stability after surgery. Although modern cataract surgery is performed since the 1950s, there are still many issues that are not yet understood. I expect that approaching to them with a point of view slightly different to a clinical one we may better understand them and provide surgeons with better equipments to assess problems. We are also working evaluating some non conventional approaches to the problem of presbyopia (the pinhole effect applied to corneal inlays). Concerning myopia research, I am really looking forward for the outcome of the clinical studies using new optical solutions to stop the progression of myopia. We will have to evaluate those results and check/recheck the validity of the peripheral hyperopia hypothesis as an anti-myopic optical solution. Given three wishes for free - what would you wish? Juan Tabernero: I can only wish I can keep working at the lab like the last ten years. I feel happy and comfortable at work. The research lines I am working on are interested enough to keep me busy for at least another ten years more! In Spain, as a result of the financial crisis, there have been dramatic cut downs on the budgets for science. Positions and grants are obtained harder than ever and at the end, without the government supporting new young human resources for science is difficult to predict a positive future. For that reason, my only wish is that I can keep working in my own country. That way, I am sure that successful results will keep coming on time!